The Sonata has more total interior volume than any vehicle in its class (122.4 cubic feet). In addition, the Sonata also has the most head and leg room in its class as well. The new leather-wrapped, three-spoke steering wheel gives drivers a sense of excitement to drive through the city or explore the highways throughout the USA. When it comes to those occasional front-seat disagreements over temperature, nothing beats a system that lets both people control the climate on their side of the car, thanks to Dual Climate Controls that allows you to have customizable micro-climates for two. 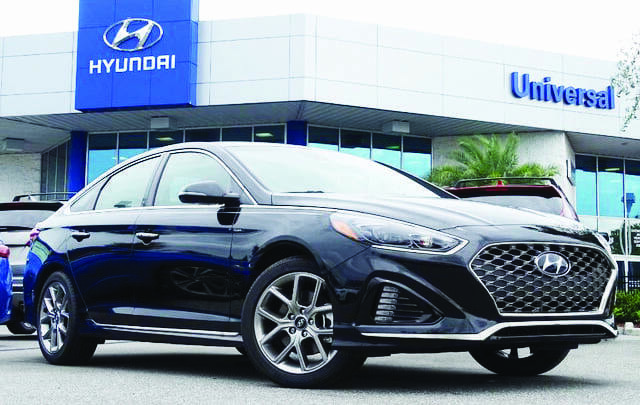 The new Sonata Limited has a redesigned front fascia, new cascading grille design and LED headlights, tail lights and LED daytime running lights. Plus, the newly sculpted back is just as appealing as the front. Rear Cross-traffic Alert* is a standard feature that provides audible and visual alerts if a vehicle is detected in the driver’s blind spot. In reverse gear, Rear Cross-traffic Alert warns the driver of vehicles approaching from the side.